Johan Turi is a familiar name to most anyone who has heard stories or read about the Sámi. Sámi are the indigenous people who inhabitate the Arctic area of Sámpi, which today encompasses parts of the far north in Norway, Sweden, Finland, and the Kola Peninsula of Russia. Johan Turi (a.k.a. Johannes Olsen Thuri) was born in Kautokeino, Norway in March of 1854. Kautokeino is in the northernmost fylke (county) in Norway and shares a border with Finland. The community is straight north of Sweden. Johan Turi was a wolf-hunter, a bear-hunter, an artist, and a bachelor with a dream. His dream was to publish a book that told the story of his people, the Sámi life. In 1908 this dream was about to come to fruition. He hand-wrote a manuscript into several bound notebooks. He included 14 hand-drawn illustrations. This all took place during a two-month stay in a hut at Duortnojávri; Torneträsk. Emilie Demant Hatt, a Danish artist (and later ethnographer), encouraged Turi to write down his stories. She took these notebooks back to her home in Denmark, transcribed them, and translated them with the help of Anders Pederson and Vilheim Thomsen, two philologists.The final publication was an innovative bilingual edition written in both Danish and Sámi. This unique piece of literature was soon translated from Danish into German, English, and several other languages. 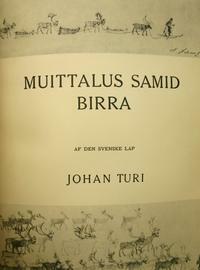 The year 2010 marked the one-hundredth anniversary of the first publication of Johan Turi's Muitalus samiid birra (An Account of the Sámi), the first secular book ever published in the Sámi language. 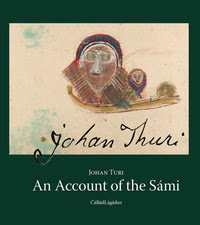 Turi's book is a classic of Sámi literature and cultural history. It provides fascinating insights into Sámi traditional practices, from reindeer husbandry to hunting and trapping, to childbirth, healing, courtship and song. Turi's account provides a unique glimpse of turn-of-the-twentieth-century Sámi life. Now a direct translation from the Sámi language into English is available. Thomas A. DuBois, professor in the Department of Scandinavian Studies at the University of Wisconsin, reviewed the original notebooks written in Turi's handwriting, and translated them directly into English. Illustrated with examples of Turi's artwork, this new English translation has been published in a 221-page hardcover book, by ČálliidLágádus (authors' publisher), located in Deatnu/Tana, Norway. Last week I wrote about the The Sámi-Americans of Poulsbo. 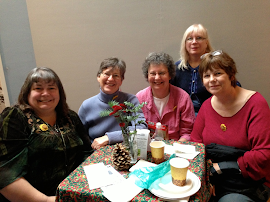 In that post I mentioned meeting author Ellen Marie Jensen at the Poulsbo Historical Society (Tuesday, January 8, 2013). She was there to share this exquisite publication with the Poulsbo community. The story is well worth reading, and the black-and-white and color pictures are magnificent. Currently, the book can only be purchased from the publisher (for US $75). I was able to purchase my copy of the book -- a valuable keepsake -- following Ms. Jensen's talk, however. Also of note: Barbara Sjohoim, a Pacific Northwest author, has posted insights into the Johan Turi story on her blog Lapponia: a northern state of mind, including analysis of rumors about Johan Turi and Emilie Demant Hatt that have circulated over the years. Ms. Sjohoim is in the final stages of writing a book about Emilie Demant Hatt's life. Titled With the Lapps in the High Mountains, it will be published in May 2013.